I design and present custom linking strategy and link building workshops live via screen-sharing for you and your team. Some clients sign up for one workshop every month, others select one or two workshops that focus on their areas of greatest need. These workshops feature linking strategies and tactics designed specifically for your site(s). It’s a very easy process, and we can get it done quickly. I don’t just lecture for 90 minutes while you try to stay awake. I want you to ask questions, make comments, see examples, and provide feedback. After the workshop/course has been presented, I send you a recording of the session (screen and voices). Each live video workshop/course I create for you will be about 90 minutes long, focus on one or two very specific topics, and cost $1,500. Below are example topics I can create a custom workshop around that focuses on your site. These are not generic courses. Each course is created by me for you and your site and objectives. You can request as many workshops as you wish. The price will be $1,500 per one 90 minute workshop, which includes me creating the workshop content and presenting it. 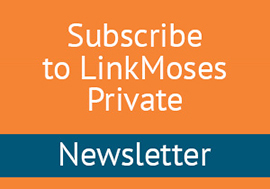 Contact me for further details and to discuss which linking related topics make sense for you. Feeling Anxious About Googles Ongoing Updates? 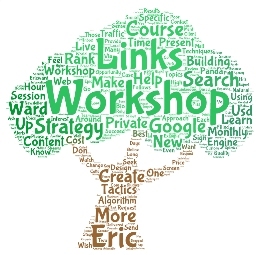 Long time linking strategy expert Eric Ward presents private link building courses to help you succeed in the new world of Penguins, Pandas, Hummingbirds, and beyond. Eric is respected linking strategist and consultant, and his live courses are designed to cut through the mass of incorrect information and give you accurate, actionable linking tactics, techniques and linking strategies that are specific to your site. Strategies that will help you overcome changing search engine algorithms, and at the same time teach you methods for creating new traffic streams so you are less reliant on search engines for traffic. These days, relying on Google as your main source of traffic will cost you your business. Trying to optimize your web content for the search engines can feel like throwing darts at a moving target. In February 2011, Google quietly dropped a bomb on the online marketing world in the form of a major algorithmic update called Panda. This change dealt an epic blow to sites with low quality and duplicate content as well as heavy advertising. With Panda, thousands of website owners watched in dismay as their rankings plummeted. And Google didnt stop there. It released several more iterations of Panda in the months to come followed by Penguin in April 2012, which penalized sites using “un-natural” link building techniques. Google then introduced Hummingbird, its search algorithm that aims to improve the accuracy and relevancy of its query results. The only constant at Google these days is change. Using a highly complex algorithm with over 200 factors, the search engine giant is on a mission to eliminate poor sites and poor content from its search results  and reward sites that provide useful information and content and actively engage with the social communities around their products and customers. The most effective linking strategies are those that help you succeed regardless of your search rank. Unfortunately, too many marketers put all their eggs in Google’s organic search basket, hoping to rank #1. Now more than ever you must learn how to develop relationships, links, and traffic streams that do not rely on Google’s algorithms. Google is important, yes, but you must create an online presence that allows you to succeed no matter what fluctuations happen in the organic results. Let me help you get where you want to be, so you don’t wake up every morning in a panic wondering if your Google rankings dropped overnight. The web is more than Google. Let me show you how to turn that fact into an actionable strategy.